To get the best outcome of your weight loss efforts, try and avoid these 10 foods. Added sugar seems omnipresent; be it soda, bars that we like to chew on, toffees, baked sweets, caffeinated drinks, lattes, energy drinks, etc. when we consume such high sugar foods, it adds more glucose to our body which cannot be processed quickly. This increases the level of a toxin called ‘Cytokines’ which deters our weight loss efforts. Further, sugar also weakens our immune system and immunity towards infectious diseases by restraining the functions of ‘white blood cells’. We have been hearing that dairy products like milk, soft cheeses, yogurt, butter, etc. are important for us as they have high calcium content. While they do have calcium content but dairy products need to be consumed in moderation, when consumed excessively, they can also cause inflammation by decreasing the visceral bacteria called microbiome which helps in weight loss; dairy is also a source of saturated fats and in addition many adults have dairy allergies which may not be lactose intolerance but maybe related to some other proteins in dairy products, such allergies increase the levels of histamines. Plus, there are a lot of calcium rich non-dairy foods available in the market. The ones we love including french fries, fried chicken, fish sticks, chicken tenders, onion rings and so many more, have got to go out of your diet plan. 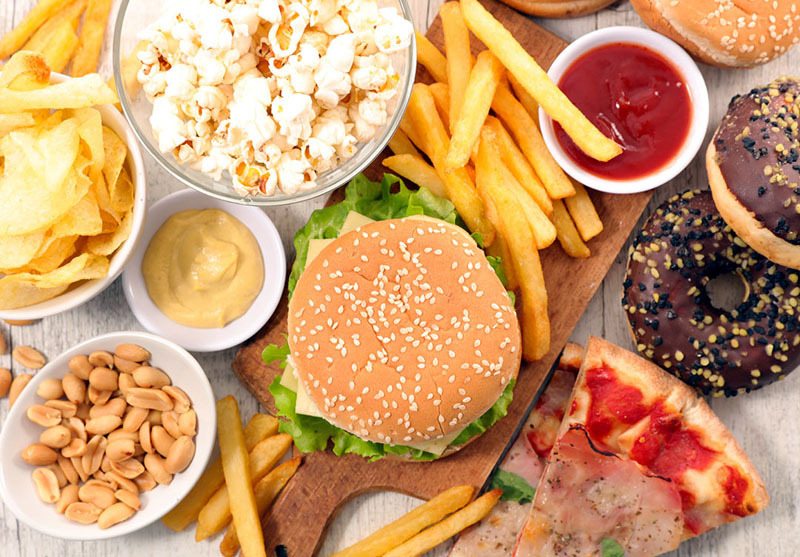 The problems with fried and processed foods is that they are fried in omega-6 rich vegetable oils and secondly, the processed foods when cooked and then dried or smoked are high in Advanced Glycation End Products (AGEs), compounds which is another super inflammatory compound. As per a study, there is a direct relationship between the level of fried and AGE rich foods & the level of inflammatory compounds i.e. if you lower the consumption of AGE rich foods, the inflammatory compounds in the body will also lower and thus you could actually see some change brought on by your weight loss efforts. Also known as partially hydrogenated oils, transfat is a compound which our body in incapable of breaking down once ingested. Due to this, food products including baked goods like doughnuts, cookies, and muffins; non-dairy coffee creamers; frozen pizza; frosting, etc. that contain trans fat are like aliens in our digestive system and the body might react via inflammation. Also, trans fats are known to damage the blood cells by damaging their interior lining. Vegetable oil replaced the sinful transfats. However the messiah i.e. vegetable oil with commonly used variants such as soy, corn, sunflower, safflower, etc. is no better as it has a high content of omega-6 fatty acids. Instead of opting for oil with omega 6 content, opt for one with omega-3 content which is an anti-inflammatory food and helps your weight loss efforts. Various studies have concluded a connection between saturated fats causing and promoting the development of adipose tissue i.e. fat tissue. Also, as the consumption of saturated fats increases it leads to a systematized release of compounds that cause a serious hindrance in your weight loss efforts. Popular sources of saturated fats are burgers, pizza, chips, etc. White bread available in the stores contains yeast which tenfolds the speed of fermentation. Your digestive system has to do a herculean task to digest the gluten in the bread, which causes inflammation of the lining of visceral organs. Further, some studies show that strains of wheat contain amylopectin A, a super starch which causes adverse effects on weight loss efforts. Various studies have shown remarkable effects of one drink per day like the flavonoids and antioxidants in wine, probiotics found in beer help aid weight loss, however, the remarkable effects turn out to be adverse if you exceed one drink. Excessive alcohol leads to the development of toxins and chemicals in the body which may be harmful to liver cells, increase inflammation, and lower our immunity. Fast food has a high presence of phthalates which is a harmful toxin that disturbs and interferes with endocrine glands. Further, the packaging that the food is packed in also contains phthalates which gets transferred to the food inside. Phthalates, as per a study has close proximity with the development of a metabolic syndrome which is a disease caused by inflammation in the body. Artificial additions to our morning cereal, processed foods, ice creams, etc. have artificial coloring which is usually made from petroleum or oil and causes various health problems including a hormonal imbalance, hyperactivity in kids, tumor development in animals, etc. Further, a study also found the additives to contain chemicals that are used to thicken food which also causes inflammation and increase in weight of animals.